Watch our 2-minute video of tips to translate your great work into an equally great abstract. ASHG 2017 abstracts are due in just a few weeks, and every year, abstract authors have the same question: How do I get my abstract programmed? The Rules & Policies and Step-by-Step Submission contain important information about how to conform to ASHG standards and avoid rejection, but today I’ll share some more nuanced tips to help abstract authors rise to the top of the pile. First and foremost, write a clear, concise abstract that specifies what you did and why it’s exciting. If you sent your abstract to a friend in a distantly related genetics field, could he or she easily identify the work’s purpose, methods used, and key results? If not, then it’s back to the drawing board (or computer, in this case). You may think the information is self-evident, but abstract reviewers each read 150-200 of the >3000 abstracts submitted and will appreciate clarity – they are not mind readers! Abstracts with broad scientific appeal and new information are more likely to be chosen for talks, especially for the Plenary Sessions. When asked their main reason for attending, most meeting attendees want “to hear about cutting-edge science.” Avoid using general language and clearly state what new information you will present, even if part of your work has been published. It is tempting to recycle language from old abstracts, but keeping your science fresh requires constant updating and a critical eye. Spending an extra hour on writing can reap big rewards if you are awarded a coveted speaking slot. Remember: your abstract must report scientific findings. Abstracts are not the proper place to announce the availability of a new resource or service, or to advertise a particular product. Discussion of commercial products is permitted and colleagues from industry are encouraged to present, but remember to present objective information about those products, based on generally accepted scientific evidence. Presenting your work as “X product works better than Y product” is a sure way to score poorly during review. Once you have perfected your abstract and are ready to submit, you may be wondering which main topic and subtopic to select. In 2016, the topics were reorganized for the first time in many years. Authors now choose one main topic and one subtopic indicating what clinical phenotype, related trait, or biological system is being studied, rather than a single topic that might inaccurately describe the research. Of course, given the rise of interdisciplinary and collaborative studies, some authors will still struggle with this classification system. A good rule of thumb is to choose the topic and subtopic that are most appropriate for review. The number of talks chosen from each topic is scaled to the number of submissions, so your abstract has an equal chance of being chosen for a talk regardless of topic. Be sure to tag keywords in your abstract to help the reviewers and Program Committee identify exciting research and build themed sessions. Follow these tips and submit by June 7, 2017 to have your work considered for ASHG 2017. 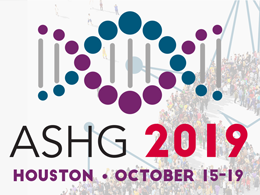 Then, check out the overview of ASHG’s abstract review process and register to see all your colleagues’ impressive research. Emily Greene, MS, is the Meetings Program Coordinator at ASHG. She works with the Program Committee and Meetings department to put together the scientific program for the ASHG Annual Meeting.